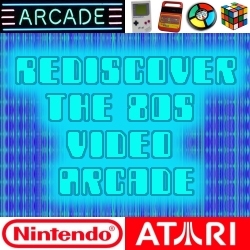 Home / Atari / Atari 2600 / Current Events / Gameboy / Nintendo / Simon / Speak and Spell / video games / Come Play At The New RD80s Video Arcade!! Come Play At The New RD80s Video Arcade!! These are the 80s arcade classics you remember pouring quarters into for hours on end! Games include Pac-Man, Donkey Kong, Frogger, Galaga, Kung Fu Master, and my personal favorite Q*Bert. Here are the games that brought the arcade to your home in the early 80s on the Atari 2600. Included are Asteroids, Missile Command, Kaboom!, Bezerk, and Breakout. The Nintendo Entertainment System single-handedly brought the video game industry out of the doldrums in the mid 80s and was responsible for awesome classic video games. Included on the new site are Super Mario Bros., Legend of Zelda, Mega Man, Contra, Excitebike, and the shooting classic Duck Hunt. There were many handheld games in the 80s that kept us occupied. And then when the Gameboy came along in 1989, Nintendo breathed new meaning into portable gaming. Included on the site is the popular Simon, a Speak & Spell emulator that will make you think you are seven years old again, and the orifinal Gameboy game Tetris. Enjoy the games everyone! Click the tab in the main menu on RD80s. Please leave some feedback on the new site and also let me know of you've spotted any games that deserve a spot on the new game site!